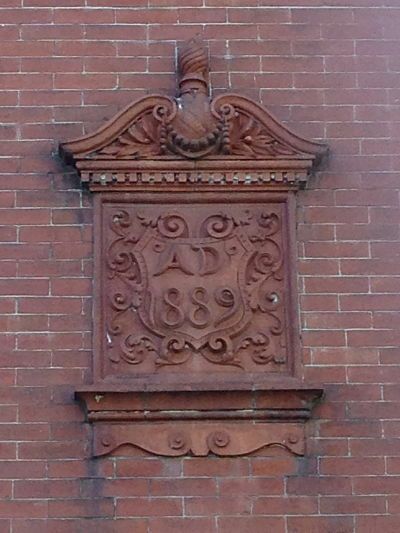 ← September 21: Where in Historic Bristol Borough is This? We hope everyone had a great time at Historic Bristol Day yesterday. And now it’s time for the next edition of “Where in Historic Bristol Borough Is This?” Here’s a close-up of a detail in the borough. Leave a comment below if you know where it can be found. Reminder: Please don’t include building owner/occupant names if you are including an address. Update 10/20/2014: Well, that was an easy one, I guess. If you guessed the Bell Apartments at 824 Radcliffe Street, you were correct. For information about this beautiful structure, see this entry from the new Tour Bristol Borough website at http://tourbristol.org.